World American | Where Quality Meets Value! We use the most recent market data to continually improve the quality of our aftermarket truck parts. The part you’ll receive is the product of our many years’ experience and testing. Each aftermarket truck part endures a careful inspection before shipment. EZ-Link is available for most existing customers. It will allow you to check stock instantly and order online. Providing our customers with quality truck parts that exceed industry safety standards is paramount to us at Midwest. This utility will guide you through a series of questions that will help narrow down the exact part you need. Strategically positioned around the U.S. and Canada, our offices can ship your package to you within 48 hours. This utility will guide you through a series of questions that will help narrow down the exact part you need in Spanish. 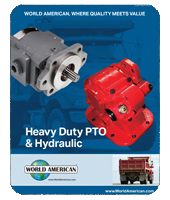 World American is the Heavy Duty and Export Division of Midwest Truck & Auto Parts, Inc. We supply drivetrain, brake, steering, electrical and hydraulic components to the heavy, duty aftermarkets. Specifically, we distribute Manual Transmission & Transfer Case Components, Differential Components, complete Rebuild Kits, Bearing Kits, Ring & Pinion Gear Sets, Cases, Housings, Axles, Yokes, U-Joints, Air Brake Valves, Brake Chambers Brake Hardware Kits, Air Springs and more. We are wholesalers only. Distributorships are available in both national and international markets. From Axles to Gears, Transmissions to Rebuild kits, Shifters to Lockers, Chains to Gear Oil, Midwest excels in quality. Nobody has a more comprehensive library of catalogs than World American! Below is a sample of our library of catalogs. To view the full library, click on this link. Complete hydraulic wet line kits and related parts to meet the ever demanding mobile hydraulic market. Replacement parts for Chelsea® brand power take offs, and Commercial® style pumps. OEM quality replacement suspension & brake components including chassis & cab air springs, shock absorbers, air hoses, gladhands, brake chambers, camshafts, brake hardware/springs, trailer & landing parts & much more! OE Quality Replacement Heavy Duty EZ- Touch® Clutch Assemblies & related parts. Save time and money with all new parts, no cores required! Come visit us at: AUTOMEC 2019 Booth: D220 Sao Paulo Expo, April 23-27. Come See the World American Crew at HDAW 2019 Booth# 621! Stop by booth# 621 and meet the World American crew at this year’s HDAW show! I would like to THANK Motive Gear for building a GREAT PRODUCT that I will always HIGHLY RECOMMEND TO ANYONE!!!! THANKS AGAIN!!!! World American is the Heavy Duty and Export Division of Midwest Truck & Auto Parts, Inc.
We supply drivetrain, brake, steering, electrical and hydraulic components to the heavy, duty aftermarkets. Specifically, we distribute Manual Transmission & Transfer Case Components, Differential Components, complete Rebuild Kits, Bearing Kits, Ring & Pinion Gear Sets, Cases, Housings, Axles, Yokes, U-Joints, Air Brake Valves, Brake Chambers Brake Hardware Kits, Air Springs and more. Come Visit World American at Expo Transporte 2017! World American Air Springs, Now With a 3-Year Warranty! The new EZ Link Search allow you to search for ring and pinions, bearing kits, transmission and transfer case parts. It will help you and your customers quickly and accurately find the correct parts for your vehicle! Part & interchange search coming soon! World American. All rights reserved.